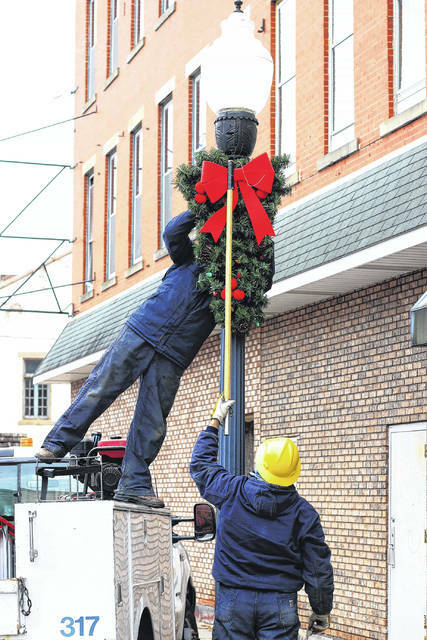 GALION — The city, is getting all spruced up for the holidays. Kyle Nulk and James Tolley, who work for the City of Galion Electric Division were out and about Tuesday afternoon putting up Christmas decorations. It’s only 37 days ‘til Christmas. The Come Home to Galion Celebration is Dec. 2 in Historic Uptowne Galion. There are plans for Breakfast with Santa at the Depot, a Reindeer Dash, a parade, a tree-lighting ceremony on the square, Santa Claus will make an appearance and a showing of the “Polar Express” is planned that day at Galion Community Theatre. Look for more information on the celebration in Wednesday’s Galion Inquirer and at www.galioninquirer.com.